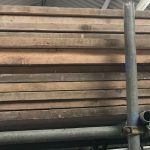 We currently hold a huge amount of timber reclaimed and used scaffold boards for sale which we can deliver across the UK. 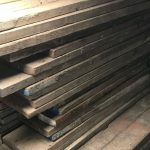 All boards are to British Standard 2482:2009, untreated and are sometimes stored outside in the elements so please keep this in mind before buying. Our second hand planks have many different uses including for garden allotments and raised beds, decking or flooring, furniture including table tops and shelving plus much much more! To place an order is very simple either fill out the contact form below or call 0800 1337934. Once your scaffold plank order is received we will provisionally book you a delivery slot which will be confirmed once payment has reached our bank account. Currently we can only accept payments by instant bank transfer and our bank details will be supplied on request. 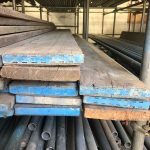 Unfortunately we have had to increase our reclaimed board prices in recent months due to increased costs from our suppliers however we sometimes are still able to offer discounts on large quantity orders of 40+ second hand scaffolding planks. Please get in touch to find out more. What can our boards be used for? A scaffold board is a brilliant choice to use as decking in the garden as they are very durable to the elements. A cheaper choice for flooring where you cover a lot more of an area with old reclaimed boards. Give them a sanding down and varnish them or not, it depends on the look you are after but either way you will have a solid great looking floor. If you are after a rustic look then using a reclaimed timber scaffolding board for making an indoor or outside table is a great choice. Many people are opting to use old scaffold boards for furniture and are being more adventurous with their builds, here are a few ideas on what can be made using them including tables, plate rack, chest, TV stand, bench, bed frames and bookcases. Looking for an alternative floating shelve, try using old scaffold planks. Sand them down, varnish them and add an invisible bracket to hold the shelves up. Outside planters are becoming a big craze in gardens around the UK but they are quite expensive to purchase. Why not try making your own out of old reclaimed scaffold boards which you can build into all different shapes and sizes. 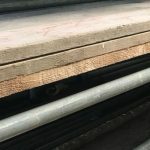 We deliver to the whole of UK but our delivery costs are based on how many scaffold planks you order and how far you are from our depot near chichester. We can sometimes offer a local next day delivery service. Unfortunately we do not currently provide a collection service. 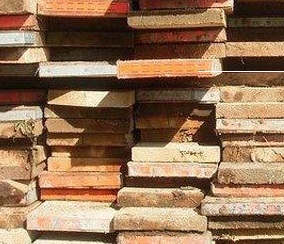 So please do not visit our yard as we will not be able to fulfil your board order. 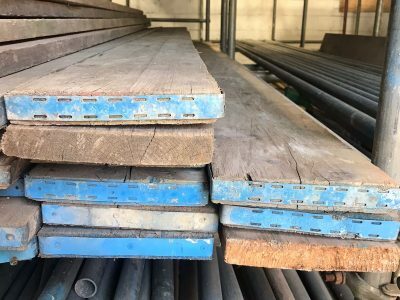 We sometimes stock unbanded timber planks but not all the time so you will need to contact us first to find out about availability and costs. 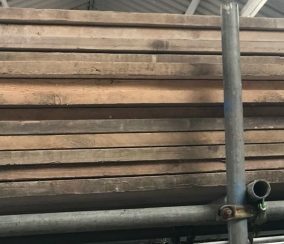 All of our used scaffold boards are 9 inches in width and are approx 38mm in thickness and we supply 13ft, 10ft, 8ft and 6ft lengths.